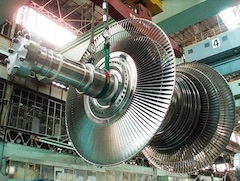 TOKYO, Feb, 28 2019 - (JCN Newswire) - Mitsubishi Hitachi Power Systems, Ltd. (MHPS) announces that the steam turbine generation systems supplied for the Sanmen and Haiyang nuclear power plants in China have cleared all functional, safety confirmation, and other required performance tests. Full-fledged operations have already begun for Sanmen Unit 1 and Haiyang Unit 1, the first and second 1,250 megawatt (MW) class pressurized water reactors (AP1000), and this completes the work for all four units (total 5,000 megawatts) at the next-generation nuclear power facilities built in China. As with the first units for each plant, MHPS conducted thorough prior verification tests of the interface between the nuclear reactor and turbine sides. Accordingly, there were absolutely no problems with interface, which had been a concern during the testing stage, and the meticulous project management and close communication led to a smooth start of official operations. This project has also demonstrated the high level of technology and consistent quality of the turbines and other equipment designed and supplied by MHPS. The Sanmen nuclear power plant was built by Sanmen Nuclear Power Co., Ltd. in Sanmen, Zhejiang Province, south of Shanghai, while the Haiyang Nuclear Power Plant was built by Shandong Nuclear Power Co., Ltd. in Haiyang, Shandong Province, approximately 130 kilometers east of Qingdao. Each facility has two units, each with an output of 1,250 megawatts (total 2,500 megawatts). Based on a technology transfer agreement with Harbin Electric Corporation, MHPS handled the designs for the turbine, heat exchanger, and auxiliary equipment, and transferred the technology. MHPS also manufactured and provided 12 low-pressure turbines, four high-pressure turbines, the main valves, and other equipment for all the units within the facilities. Harbin Electric handled the manufacturing of the turbine casings, heat exchangers, and other equipment, while Mitsubishi Electric and Harbin Electric each supplied two of the generators. Going forward, from the standpoint of maintaining the safety and reliability of both units after startup, MHPS plans to provide assistance including checks and repairs during the initial regular inspection. MHPS will continue to contribute to resolving the global issues of stable energy supplies, economic development, and reducing the environmental load by providing steam turbines for safe, highly reliable nuclear power generation facilities. About Mitsubishi Hitachi Power Systems, Ltd.
Mitsubishi Hitachi Power Systems, Ltd. (MHPS) was formed on February 1 2014, integrating the thermal power generation systems businesses of Mitsubishi Heavy Industries, Ltd. (MHI) and Hitachi, Ltd. in a quest to further enhance their social response capabilities in all respects. These include the technological strength to create new products of outstanding quality and reliability, the comprehensive strength in engineering to oversee projects in regions across the globe, and finely honed sales and after-sale servicing capabilities. MHPS aims to come out a winner in global competition and achieve a solid position as a world leader in thermal power generation systems and environmental technologies. For more information, please visit www.mhps.com.